It seems everyone is eating and baking them right now. I tried my first ever macaron about 6 months ago at a cafe near by. In hindsight, I can see it was a pretty sad version of what a macaron should be, but even still, I love-love-loved it. It was lemon. The butter cream was cold and tangy. I am now a convert to the cult of macaron. I have since tried a perfect hazelnut offering from Sweetness Patisserie, and even sampled a a few bites from the impressive Macaron Bar at Baroque (French Bistro at The Rocks, Sydney) along with various other nibbles and munches from macarons all over Sydney. As you know, my sister had a birthday recently. I threw her a little surprise drinks shin-dig and me and Mum put together some nibbles. I made the most over the top chocolate ganache icing for chocolate cupcakes and Mum tried her hand at making macarons. 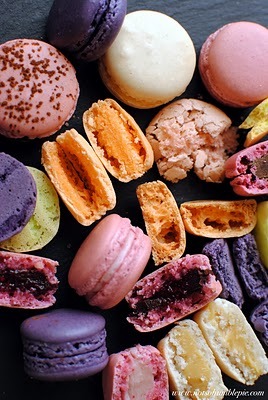 As much as I think my Mum can do anything…I had my doubts about the macarons. They are notoriously difficult – so I’ve heard. She researched recipes and stocked her kitchen with almond meal and eggs. She bought over some samples for me and they were so much better than I had expected. 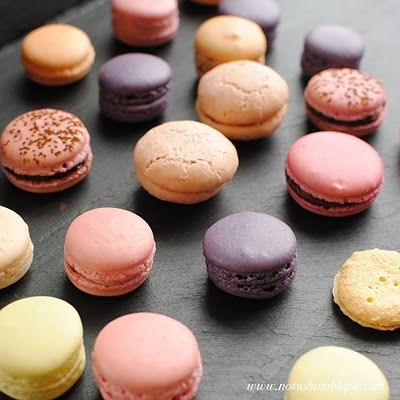 The pink and chocolate macarons were light and crisp on the outside and soft in the middle. The next day (the day of the little party) they were even better. They were greedily gobbled up at the party – a resounding success. Meanwhile as the ladies could feel their arteries hardening, half-eaten ganache laden cupcakes were put aside in order to nab second-helpings of Mums’ macarons. What a magnificent macaron moment. Mum told me it was not as hard as she had expected. She told me the recipe at Macarons 101 @ Not So Humble Pie Blog was easy to follow. Sometimes the harder you try the worse your results. In the kitchen, I think it’s always best to go with your instinct. And while I did not have time to get a photo of the macarons that night in the midst of all the surprise party excitement, I”ll post another pic from the Not So Humble Pie Blog. So we can all drool just a little bit more. Bought some more almond meal yesterday and I’m about to age some egg whites. Salty caramel here we come! !